Most of us definitely have too much stuff in our lives, so next time you're considering what to buy a loved one on a special occasion why not consider a charity gift instead? With a Practical Presents voucher, you can get great deals on gifts that transform lives. From chickens and goats sent to support families in poor rural areas to eco-friendly solar panels that provide lifelines to isolated communities, Practical Presents vouchers can help you change lives for less. Founded over 40 years ago by Dr E F Schumacher, author of 'Small is Beautiful', Practical Presents helps some of the world's poorest people work towards a better, more sustainable future. With projects throughout Africa, Asia and Latin America, Practical Presents aims to help families and individuals lift themselves out of poverty through a range of practical and innovative solutions. Instead of just giving money to those in need, Practical Presents works with communities to develop initiatives that support them in turning their lives around. Focused firmly on people and the inherent power they wield, Practical Presents provides the tools that communities need to empower themselves. So if you know someone that wants to make the world a better place, why not give a gift that changes lives through Practical Presents? The company provides a fantastic alternative to all the usual gift-buying options. How it works is simple – you choose a specific item that can provide life changing support to someone in need, then pay for it to be sent on behalf of your chosen loved one. From livestock going to help struggling farmers in Bangladesh to essential gardening supplies that will help families in Peru grow and sustain their own sources of food, there are plenty of gifts for you to choose from – so you can pick one that you think will really speak to the recipient of your gift. Once you've chosen your 'Practical Present', you'll receive a detailed gift pack which can either be posted to you or directly to your loved one. The pack will explain everything about the project you have chosen to support, and will let them know all of the good that their gift is achieving in some of the poorest communities around the world. Want to treat someone special to a gift that really changes lives? With a Practical Presents voucher you can get great deals on the full selection of charity gifts. Whether you're buying a gift for the person who has everything or just searching for a different way to show that you care, Practical Presents voucher codes will help you give more to those in need. Browse our website until you find a Practical Presents voucher that suits you, then navigate to their website to begin shopping. Click on a gift idea for more information, then click 'Add to basket' to buy. Enter your Practical Presents discount codes where applicable. If you've enjoyed shopping for inspiring gifts with a real impact at Practical Presents, you might find more ideas at BuyaGift or A1 Gifts. Or, if those aren't up your street, you'll find plenty more stores to browse in our Flowers and Gifts section. Enter your Practical Presents voucher where applicable. Choose an address for your gift pack and click 'Next'. Enter your recipient's details and click 'Next'. Gift pack delivery is free on all orders. You can also choose to have the details of your gift sent to the recipient in the form of an e-card. Need to contact the team at Practical Presents? Whether you have a question about your order, want to know more about Practical Present's projects around the world or simply want to find out how you could save with Practical Presents voucher codes, you can contact the dedicated Customer Services department by telephoning 01926 634400. Want to find out more about the amazing work happening at Practical Presents and how you can support it? Why not follow the company across your favourite social media networks? You'll find lots of interesting content including updates on projects around the world, behind the scenes videos showing where your donations go, news on issues like climate change and poverty and more. You can also use these pages to find out more about saving money with a Practical Presents discount code. Don’t forget to check them regularly, as you can never be sure when free Practical Presents vouchers might be waiting for you! Buy now online at www.practicalpresents.org. My sister always complains that she has too much stuff, so when her birthday came round I decided to get her something a little different with a Practical Presents voucher. 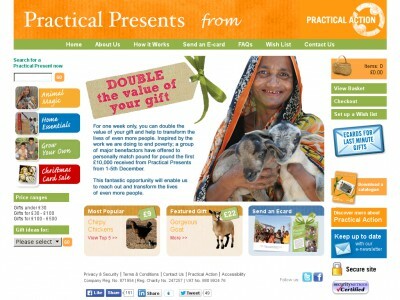 You can use Practical Presents vouchers to get discounts on a wide range of charity gifts at practicalpresents.org. I decided on a farming package that sends chickens to struggling families in Bangladesh – and got a great price with Practical Presents voucher codes. For the person that has everything, give the gift of charity with a Practical Presents discount code.